No it does not. I just used mine once and my dishes are still wet. I'm. It sure what I've done wrong. Is the height of the dishwasher adjustable? 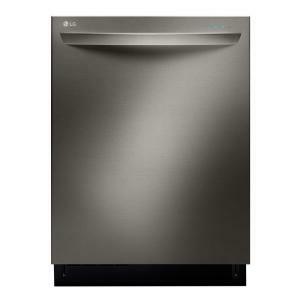 I recently bought the True Steam LG Dishwasher in black stainless. What kind of dishwashing detergent is recommended? Powder or gel? Packs or squeeze bottle? Neile did not understand your question.what is he talking about hand dishwashing liquid. &nbsp;Let me help you.stay with a detergent that dissolves quickly so the ports don't clog up,like gel. Top Control Tall Tub Dishwasher with 3rd Rack and Steam in Black Stainless Steel with Stainless Steel Tub is rated 4.1 out of 5 by 111. Rated 5 out of 5 by EarthDreamsV6 from LG BEST IN CLASS Just received and hooked up my New LG LDT9965BD In black stainless steel. And Boy I tell you this machine is years ahead of my 2014 model KitchenAid Architect II it replaced. its quieter and more sophisticated. The interior has many adjustable tines and the Steam generator is excellent.. The only thing that may annoy some customers is that their is no drying heating element in the dishwasher but surprisingly that doesn't bother me. As for some strange reason the dishes come out dry and hot. (Excluding plastics). The dishwasher tells you in real time how long the cycle has before its done washing and to wrap it up MY LG SINGS A SONG WHEN IT HAS COMPLETED THE CYCLE. how about that a SONG IN MY KITCHEN. I was so shocked and amazed. dishes came out clean and sparkling thanks to the detergent I buy online hehe. All in all buy it, It looks darn good and does the job with NO problems. Rated 5 out of 5 by Ace10K from Whisper Quiet! Ok, I want to start off saying that I read some reviews that said that this is very quiet. I was skeptical as I haven't heard many quiet dishwashers. Those reviews weren't lying. This is very quiet. My wife turned it on while we were still downstairs together. With tv noise and kids you cannot hear it at all. Without those noises I can still barely hear it. Usually with dishwashers I have had in the past, I would have to turn up the tv to hear over the loud noise. With this, I can't tell that it is on. A great feature that we like is the third top shelf for bigger spoons and other big kitchen utensils. Makes it easy to place them in there without trying to find that special spot. I uses a different drying method that some say doesn't dry their dishes well, but we haven't had any issues with that. Perhaps its the cleaner stuff that we use that helps, but either way we haven't had problems. The middle shelf also is able to move up or down which is nice when the bigger pots and pans are placed in the bottom. The water sprayer is also at the very bottom so no need to fight with shelves getting stuck on pots and pans when you pull the shelf out. The black stainless steal is amazing. Kids touch it all the time with little to no finger prints or smudges. And if it does get a little dirty, just a damp rag wipe over and its clean. No need for chemicals or special wipes (it also says in the instructions not to use anything like that because its not good for the finish). I would definitely recommend this dishwasher. I can tell that the design was carefully thought through as this dishwasher is very user friendly. Many different settings for types of wash and dry. This is still very quiet on each of the settings that we have used. Rated 3 out of 5 by hrlyguy80 from LG Model # LDT9965BD - Returned Typically, I am not one to write a review, but thought it was only fair to future shoppers, as I also rely on other's reviews when making most, but especially a substantial purchase. Not only do I want to educate future shoppers, but just maybe, LG and other manufacturers can learn more about consumers needs and desires and make the "ultimate" product for people with a lower than median income. While looking for a dishwasher, I had certain features in mind such as Reliability & Quality, wanting a third rack,, roomy & flexible rack configurations, a rinse and hold feature, steam and other key features without spending unreasonable amounts of cash. I choose this dishwasher mostly because of the reviews listed, and the "appearance" of rack configurations,. Also, it was significantly reduced due to it being offered as a "Special Buy". I will share with you what I liked about it. I like the way it cleaned dishes, though, it has long cycles which is understandable due to EPA regulations. The dishes were dry for the most part and the third rack seemed efficient, although there was one time I recall that items in this rack were not as clean as I anticipated, but in all fairness, they were knives used to cut into a block of cheese. I did like the removable trays in the 3rd rack as well, but found the third rack "a little dry" when pulling it out and pushing it back in to place. I also like the adjustable tines in the lower rack which helped accommodate odd shaped items. I also wish it had a pause feature, because if you attempt to add an item after the cycle is started, you will get wet opening the door as everything is still turning when the door is open. Now, I will share with you my experiences that made me dislike this product. The times in the lower rack were adjustable as noted but these tines feel flimsy, and I don't see them having much longevity. They also didn't maintain there position when adjusted, and drop down unintentionally when you are placing in dishes etc.. Also, plates and dishes didn't stand up well in these all "straight" tines and often rolled out of position and fell against each other when rolling in the rack. This was biggie for me and drove me nuts. I didn't chip any dishes, but they still should not need to be "repositioned" when closing up the dishwasher. I did like the steam function of this dishwasher, but the side placement seems to inhibit its ability to "hit" all the items in the lower rack. It is great if you have "that one" dish that needs to be steamed cleaned, but if you put a cookie sheet or large pan on the left side, it will block this feature. Would steam be better utilized at the back of the machine? How about up from the bottom? Also, while im talking about the lower rack, this may sound picky but I found the handle on the silverware basket obnoxious, and in the way. One would think it could be made to drop down and recess out of the way so the consumer can add utensils without working around this large handle. The middle rack also offers "an appearance" of flexibility but I found it the most frustrating. The adjustable rack to the left works great to accommodate the nestling of bowls, especially the 6 1/4" cereal bowls we use almost daily. BUT, that's a big BUT, because when you use this space for bowls, they interfere and take up to much room for glasses to the left and right of this space. Any cups such as coffee cups and mugs now hit and interfere with the nice bowl configuration. Forget about putting 16 oz "beer style" glasses or coffee cups on either side unless you don't mind them touching the bowls and gingerly fixing the bowls that "were" nestled so nicely. The wine glass holders/adj. rack are ineffective and were removed within the first week. To use this adjustable shelf for stemware requires you to place them at a 45 degree angle, which takes up much room and cause much wasted space. Speaking of wasting space, these shelves take up too much room even when folded up and out of the way. Out of the way? NOT. And the shelf under this flexible shelf is virtually useless, that is unless you were using green tea cups like most commonly found in Asian restaurants because that is all that would seem to fit on the right. Lastly, when the middle rack is full, there were times I wondered if it was going to drop out of place as it appeared to sag, and needed to be lifted back in place. I wondered if this was due to it not setting in properly after adjusting the height of the rack, but it didn't happen all the time and I didn't adjust the height of this rack often. Lastly, what was LG thinking when they put a non-removable sticker that appears to be a badge/emblem expressing its "10 Year" motor guarantee? Great placard if you are in the store and looking at the display and looking for value added features, but I don't want to see it in my kitchen until the end of this dishwashers days. This didn't make sense to me, and I guess it can be removed, but with great effort that could risk marring the dishwasher's finish. LG, please rethink this badge and make it a sticker. I am sorry LG if this seems like a rant, but I am being honest and reporting in-depth for your sake as well. I hope this review helps you in your decision for your next purchase.